Online video rental store Vudu has seen massive growth lately, driven mostly by getting embedded on an ever-growing number of connected TVs and other devices. But the streaming-video-on-demand service is about to get a big boost, as it’s being integrated with the website of parent company Walmart,(s WMT) potentially introducing millions of shoppers to the joy of online video. It’s been about 18 months since Walmart bought Vudu, but as demand for physical media declines, the big box retailer is finally marrying the online video service with its website. By doing so, it’s hoping to introduce its customers to a new way of watching movies and getting them to spend money on digital copies instead of buying the DVD. Steve Nave, SVP and general manager of Walmart.com, said the decision to buy Vudu was made as the retailer realized that there was a rapid shift in consumer behavior from purchasing physical media to streaming content online. The acquisition was made to help better position Walmart and its web property as this shift occurred. The result of that purchase can now be seen at Walmart.com. Users shopping online for DVDs and Blu-ray discs on the site will now also have the option of buying or renting digital copies of titles that are available as part of the Vudu streaming library. Once purchased, those movies can then be accessed either through the Walmart website, Vudu.com or on any of the 300-plus connected devices that the Vudu streaming service is available on. The move to add the service to Walmart.com comes just a few months after Vudu introduced its own browser-based streaming option. But it’s not just the Vudu service on a Walmart URL: The integration keeps the same look and feel of the retailer’s website, while introducing a wide new range of streaming content. Existing Walmart.com customers will be able to link their accounts with the Vudu service and seamlessly purchase movie titles without having to switch logins or change sites. Now for the bad news: For those that want to stream videos in HD, they’ll have to watch the movie on one of Vudu’s supported devices. 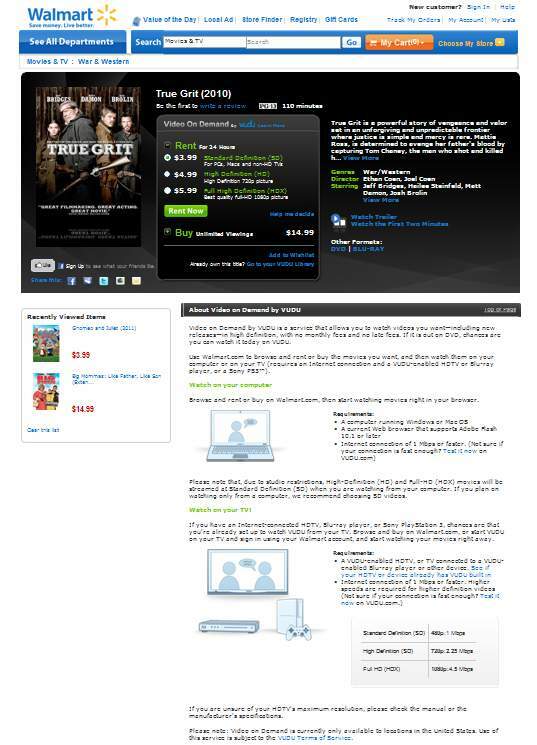 The Walmart.com site, along with Vudu.com, only stream videos in standard definition. While many purists will only want the highest quality video, for many Walmart shoppers new to streaming movies online, that might not be a big deal. Adding the Vudu service to its website also comes as the retailer is experimenting with new ways to get its users to try out the service. That includes the introduction of new digital movie cards that users can purchase from Walmart stores and use to redeem streaming movies later. The company has also been working with Hollywood studios to enable customers to buy a physical copy of a DVD and be able to stream it from Vudu on supported devices. Good luck, late to the game Walmart! Standard def streaming when I can get better from Netflix on anything with an Internet connection! How much are you going to try to charge for this obvious inferior service anyway? I’ve had that Vudu thing on my Bluray player from the beginning, right next to Netflix. I was always curious about it, but now I can completely ignore it.